See scan - absolutely perfect condition. This is an extremely nice and rare Romanian / Rumanian early post WWII Communist era Fire Squad / Firefighter Merit badge with original case. The badge is large and has one of the most colorful and fantastic cloisonne enamels we've seen. 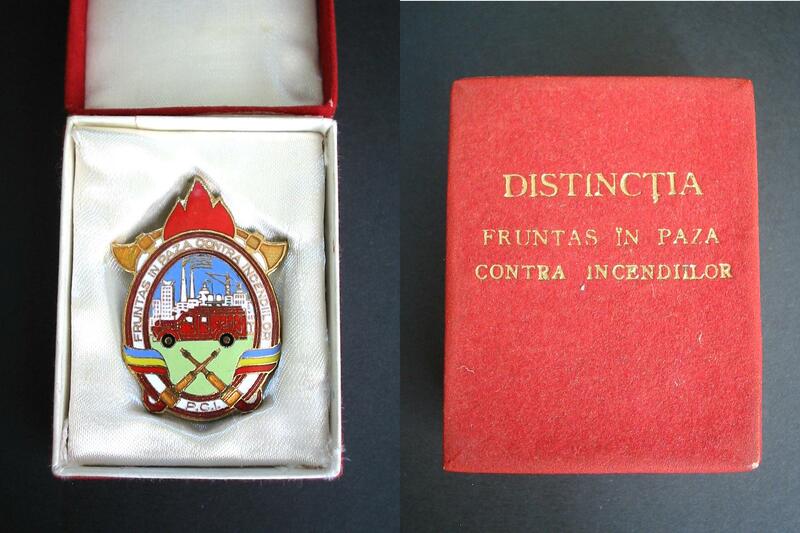 There is a text both at the badge and the lid of the case saying in Romanian - DISTINCTIA FRUNTAS IN PAZA CONTRA INCENDIILOR. We think this special distinction decoration was awarded only for extreme courage during a fire. Absolutely scarce militaria collector piece and one of the rare Romanian badges.